A computer is a device that has a processor, can run a program from memory, contains storage for data, and has methods of input (like a keyboard, pointer, or touch screen) and output (like a display or printer). These four features may be built into a coffee maker, but we don't consider it to be anything more than a coffee maker. We have developed some stereotypes of what makes something feel like a computer. The box that is sitting on or under your desk with a monitor attached is a computer. Computers may also be that clamshell arrangement that you type on - that is called a laptop computer. A big university or research lab may have a room filled will large cabinets; these cabinets may house computers or altogether make just one jumbo computer. Despite the four basic features of a computer, we have come to associate what a computer is with these stereotypes. Another stereotype is that a computer runs one of a select group of operating systems: Unix, Windows, Linux, or Mac OS. There may be many other operating systems, but they are mostly ignored when reporting sales or market share of computers: No one reports Palm, Newton, or iPaq sales as part of the number of computers sold. These smaller devices, commonly called PDAs, simply aren't counted as real computers. Back when I got my first Palm, I was very proud of all that I could do with it. I could carry data from my main computer in the form of spreadsheets or Word files. It had games and ebooks to keep me entertained. All my addresses and calendar dates were stored on it. With an attachable keyboard, I could type information directly into it, just like it was a regular computer. Information was at my fingertips everywhere I went. Almost anything on my desktop computer could be synched to the Palm for reference. It was significantly lighter than any laptop and could fit in my front pants pocket. I considered it the ultimate mobile platform. Even with all they could do, Palms never progressed to being called computers. Nor did Windows Mobile devices, which could claim to run Windows, ever grow beyond being seen as PDAs. Their processors were too slow and the prejudices too well established regarding what was allowed to be a "computer". I still use a PDA, but I have toned down my expectations and needs from the device. The cell phone has taken over most of the functions of the PDA. Most of them have games, address books, calendars, and even cameras. Today's smart phones add some additional tools, such as connection to email and the Internet, but they aren't called computers. They're just smarter phones - no matter what extras are built into them. What happens when a new device has all the functions, the extra processing power, and uses a scaled down version of a stereotypical operating system? It may not look like a computer. If it can act like one and do all the work of one, will it ever get classified as one? No, it won't. It will remain in whatever category it started in. Currently, we have the definition changing on the other side. 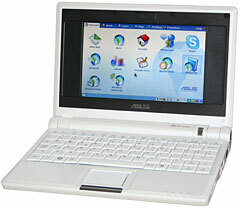 The Eee PC laptop from ASUS is smaller than any "real notebook computer" offered before. It has a less powerful processor, less storage, and less memory than the typical notebook, but it is selling so well that HP, Dell, and others feel the need to have competing models. Laptops are no longer limited to 12" and larger displays; they can now be as small as 7" (with 800 x 480 resolution on the Eee PC). People are accepting the smaller size for the obvious benefits in portability. If the laptop continues to shrink and the PDA/Smart Phone continued to grow, eventually their specifications and features will meet. Once they do, what would we use to distinguish the two devices? We will have small laptops that can place phone calls and phones that can open spreadsheets. That point has been reached. The difference will become so blurred that the stereotype of what is a "real computer" will have to be adjusted. When this happens, sorting out who has the largest market share may be redefined overnight. It is the difference in the size of the keyboard and display that keeps the smart phone from being called a "computer", not usage. Does Smart Phone Growth Mean Small Notebook Decline? Maybe a phone will always be just a phone, regardless of the capabilities that are added, but operationally and in the trend of consumer purchases they will become something else. Today you may buy a laptop to complement your desktop. Tomorrow you will buy a smart phone for many/most/all of these mobile functions. Just as the smart phone has replaced the need for a PDA or low-end digital camera, it will continue biting into the laptop market. I'm not predicting that the laptop will disappear completely. The larger screen and keyboard are important for certain tasks. Laptops themselves will continue to evolve. for example, they have branched off into behemoths that have 17" and even 20" displays. This is "portable" power more in line with a desktop computer and far exceeding anything a smart phone could offer. It is the low-power, smaller-end that will be gobbled up by the smart phone. Apple didn't invent the smart phone, but the iPhone has become the standard by which all smart phones are now judged. The method of access to functions, the idiot proof nature of the design, and even the look of the device dominate the market. The iPhone is yet another aspect of the post-PC war that Apple is waging. When the iPod was released, Dell tried to compete with its own brand of MP3 player, the Digital Jukebox. HP didn't even bother coming up with its own player, instead it licensed the iPod and tacked on the HP brand, e.g., HP iPod. This time neither of these old competitors is trying to bring out its own model to compete directly with the iPhone. Instead Apple is going up against LG, Motorola, RIM, and Nokia. It would seem like a one-sided battle, with Apple being the teeny tiny competitor hoping to gain just 1% market share, but the opposite is true: Windows Mobile is a joke, Palm has shown little innovation, and Blackberry holds little beyond push email delivery. 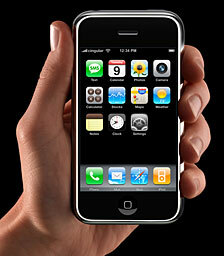 The iPhone has already achieved over 25% market share in the smart phone market. The phone manufacturers still see their devices as phones with extras thrown in. Apple has reversed this business model and is providing an OS X mobile computer with a phone thrown in. By giving the device the name iPhone, they have disarmed their competition as to the true nature of the battle. Apple couldn't halt the progress of additional software for the iPhone. From the start it was endowed with the innate ability to do more. There was no hiding this potential once people had it in their hands. People immediately started cracking the iPhone to release its potential. Apple is already supporting iPhone software development, and from this position Apple will continue to shape the nature of the device, driving the competition to constantly mimic but never catch up with it. In many ways, the iPhone and the Eee PC are mirror products across the smart phone-to-computer divide. They both sold around 4 million units after they launched in 2007. They both are looking to sell millions more units by the end of 2008. They both have the competition scrambling to come out with a truly competitive model. Even the prices are not all that different. The newest model Eee PC is going through typical feature bloat to make it more mainstream. It has a larger screen (10.2" 1024 x 600) and such. They have already lost the focus on how to continue making it smaller and more portable. Instead they want to turn it into a regular laptop to compete with all the other ones on the market. Apple is way ahead of the others in the smart phone business by the simple merit of including OS X with the iPhone. I'm sure many functions had to be stripped out to make the operating system small enough to fit, but each year, as memory space grows and processor speed increases, more functions will creep into the iPhone. Apple won't even have to spend R&D dollars to figure out these improvements: The software will already be developed for a laptop or desktop computer. This is the point of complete convergence, when all the functions on a mobile device (phone or notebook) match those of a desktop computer. It has a single low-watt processor to support those things you do when away from a desk. You dock it to a base station that has 4-10 additional processors, and it can instantly switch to using all these processors to handle more desktop-oriented tasks. If small enough, it could dock to a laptop or tablet PC to handle those tasks that need a larger display and a full-sized keyboard. It may seem like Apple has moved onto the phone business, but this is just another step in the evolution of computers. Apple is building the groundwork years in advance. Apple is planning at least 3-5 years ahead. When convergence arrives, that device we used to call a phone will have become a full-fledged mobile computer. Apple could face competition from a revitalized Microsoft, but that company is too ingrained in the bloatware tradition. If Vista is any guide, Microsoft shows no preparation for the day of convergence. One of the other phone OSes could be developed for convergence, but the vision within those companies may not exist to promote such a goal. Linux may have the most potential for being ready and able to offer competition to Apple. 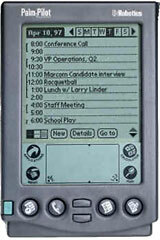 I look forward to the day when PDAs finally get recognized for what they really are, nascent mobile computers. It may take some additional blurring of the stereotypes before this perception finally clicks in for everyone. By then I will probably have moved on from my Palm to the latest version of the iPhone, but I'll still remember where I started and what a great device it was. Mac of the Day: Performa 575, introduced 1994.02.01. The first all-in-one Mac with 68040 power supports 136 MB of RAM.